Poland is a land of beautiful countryside and developing cities. Apart from the colourful landscape, Poland also has a very colorful history. Poland has. 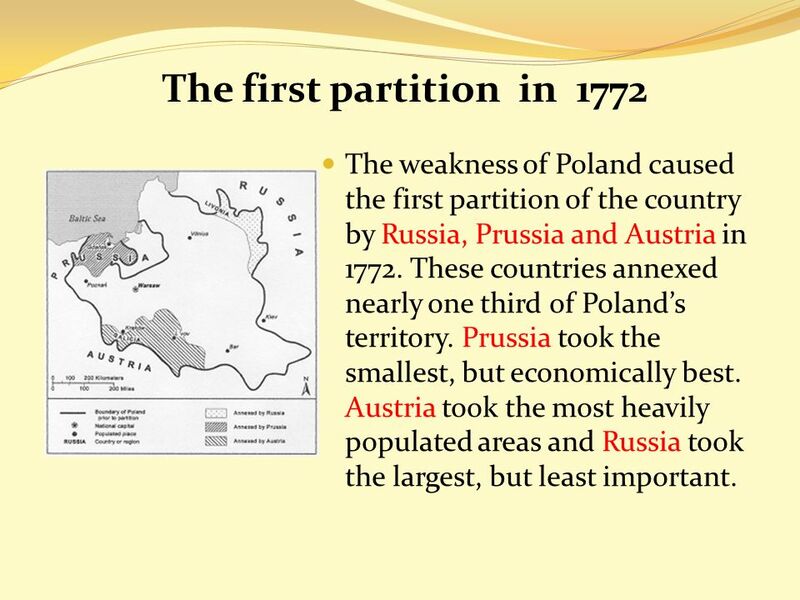 2 The first partition in 1772 The weakness of Poland caused the first partition of the country by Russia, Prussia and Austria in 1772. These countries annexed nearly one third of Polands territory. Prussia took the smallest, but economically best. Austria took the most heavily populated areas and Russia took the largest, but least important. 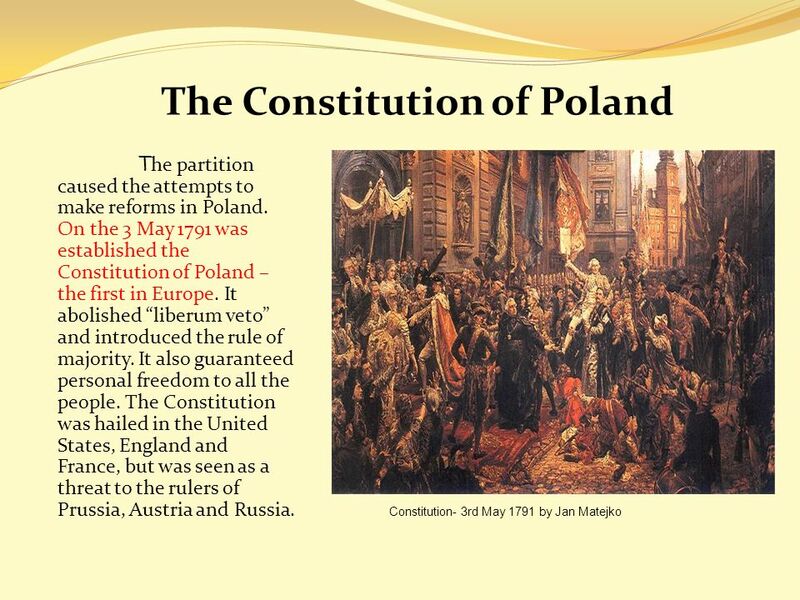 4 The second partition in 1793 H owever, it did not prevent Poland from being divided for the second time in 1793. 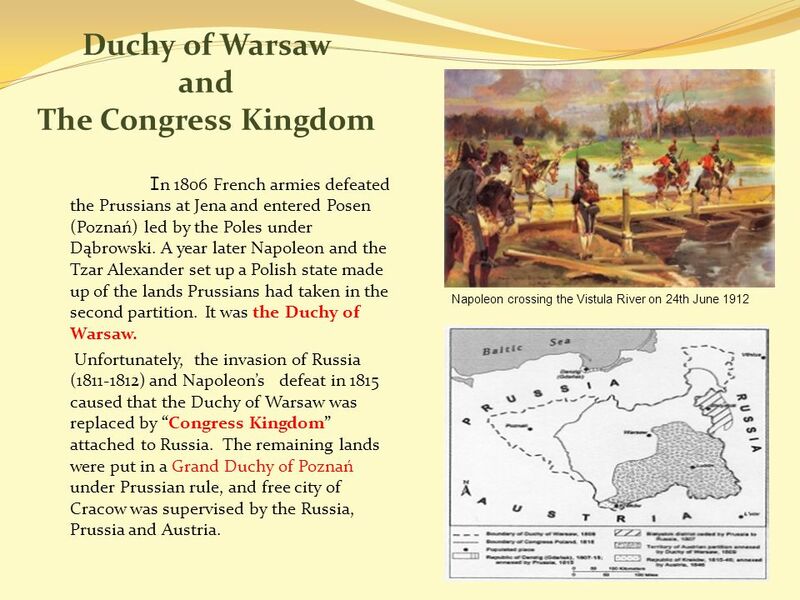 Prussia and Russia took control of additional land of Poland. They took more than half the country and about four million more of the population. 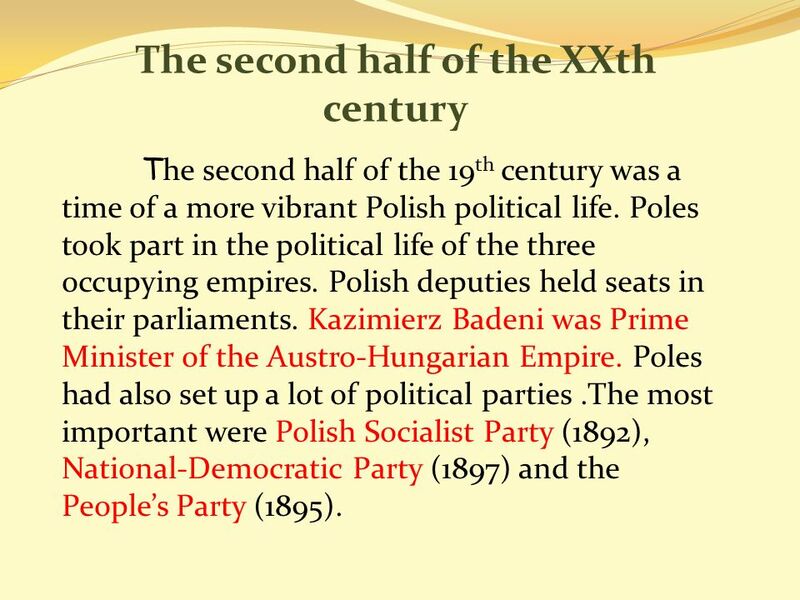 9 The second half of the XXth century T he second half of the 19 th century was a time of a more vibrant Polish political life. Poles took part in the political life of the three occupying empires. Polish deputies held seats in their parliaments. Kazimierz Badeni was Prime Minister of the Austro-Hungarian Empire. Poles had also set up a lot of political parties.The most important were Polish Socialist Party (1892), National-Democratic Party (1897) and the Peoples Party (1895). 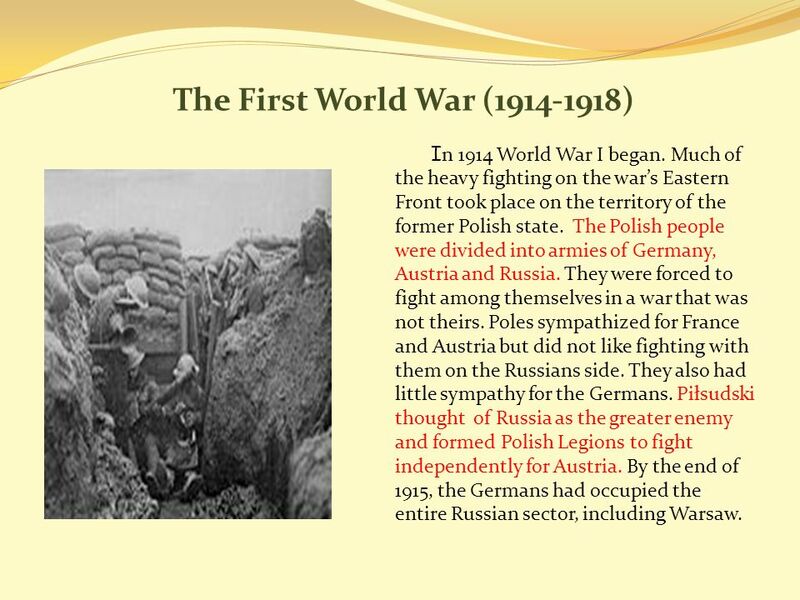 10 The First World War (1914-1918) I n 1914 World War I began. Much of the heavy fighting on the wars Eastern Front took place on the territory of the former Polish state. 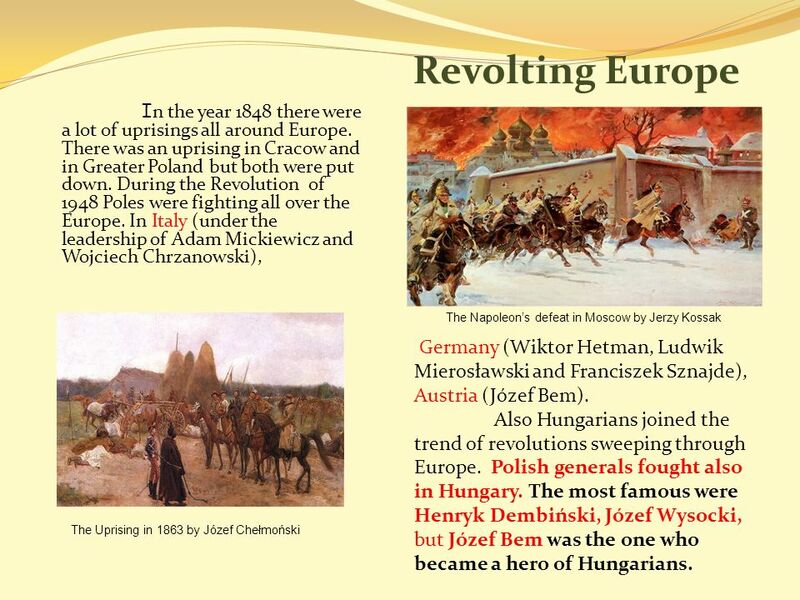 The Polish people were divided into armies of Germany, Austria and Russia. They were forced to fight among themselves in a war that was not theirs. Poles sympathized for France and Austria but did not like fighting with them on the Russians side. They also had little sympathy for the Germans. Piłsudski thought of Russia as the greater enemy and formed Polish Legions to fight independently for Austria. By the end of 1915, the Germans had occupied the entire Russian sector, including Warsaw. 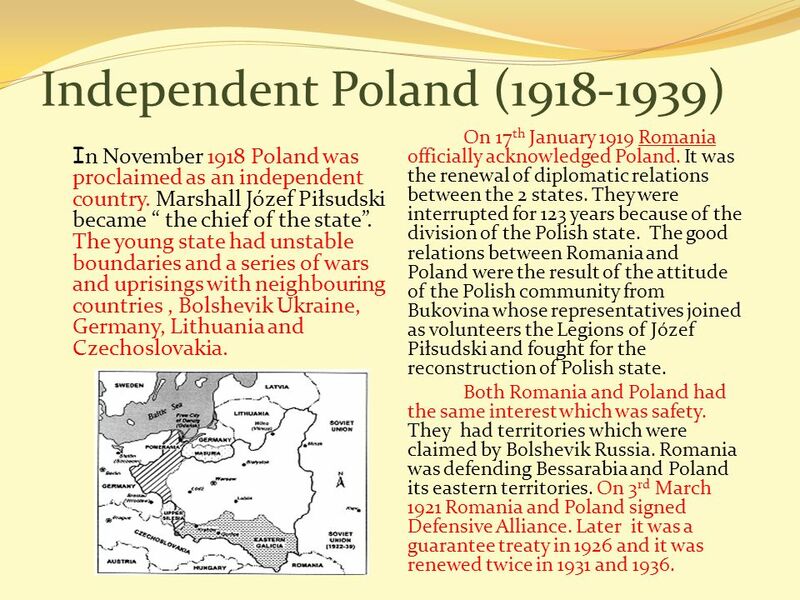 11 Independent Poland (1918-1939) I n November 1918 Poland was proclaimed as an independent country. Marshall Józef Piłsudski became the chief of the state. The young state had unstable boundaries and a series of wars and uprisings with neighbouring countries, Bolshevik Ukraine, Germany, Lithuania and Czechoslovakia. On 17 th January 1919 Romania officially acknowledged Poland. It was the renewal of diplomatic relations between the 2 states. 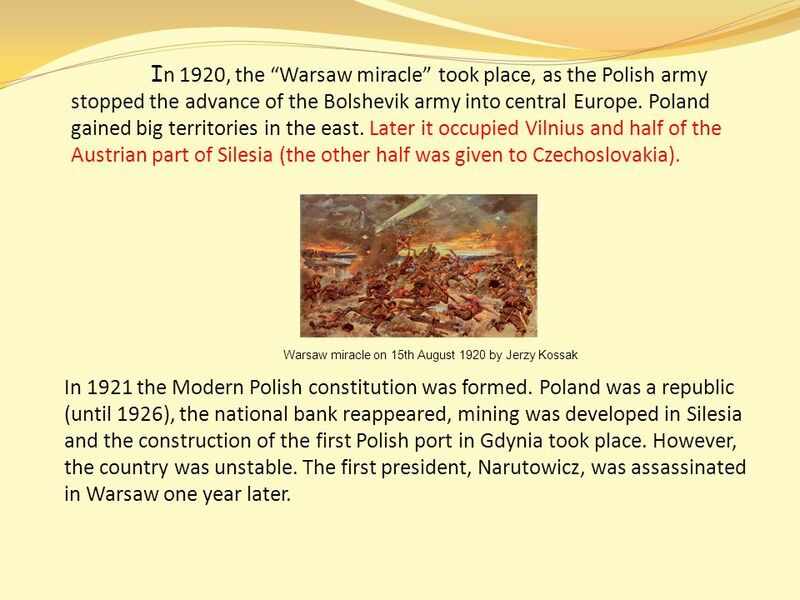 They were interrupted for 123 years because of the division of the Polish state. 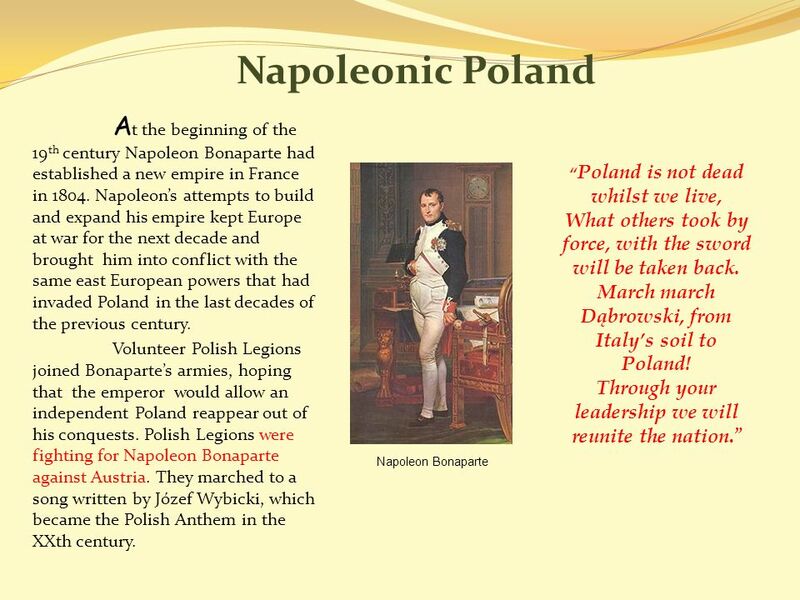 The good relations between Romania and Poland were the result of the attitude of the Polish community from Bukovina whose representatives joined as volunteers the Legions of Józef Piłsudski and fought for the reconstruction of Polish state. Both Romania and Poland had the same interest which was safety. They had territories which were claimed by Bolshevik Russia. Romania was defending Bessarabia and Poland its eastern territories. On 3 rd March 1921 Romania and Poland signed Defensive Alliance. Later it was a guarantee treaty in 1926 and it was renewed twice in 1931 and 1936. 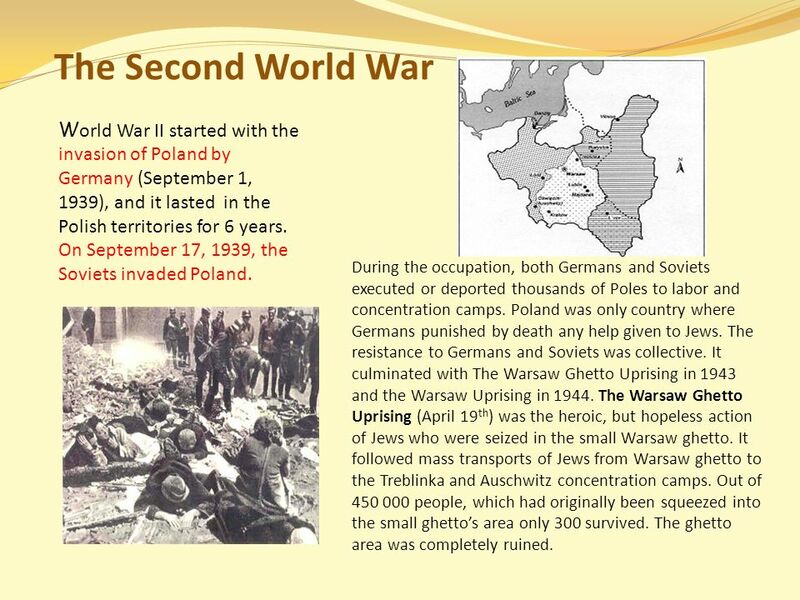 13 The Second World War W orld War II started with the invasion of Poland by Germany (September 1, 1939), and it lasted in the Polish territories for 6 years. On September 17, 1939, the Soviets invaded Poland. During the occupation, both Germans and Soviets executed or deported thousands of Poles to labor and concentration camps. Poland was only country where Germans punished by death any help given to Jews. The resistance to Germans and Soviets was collective. 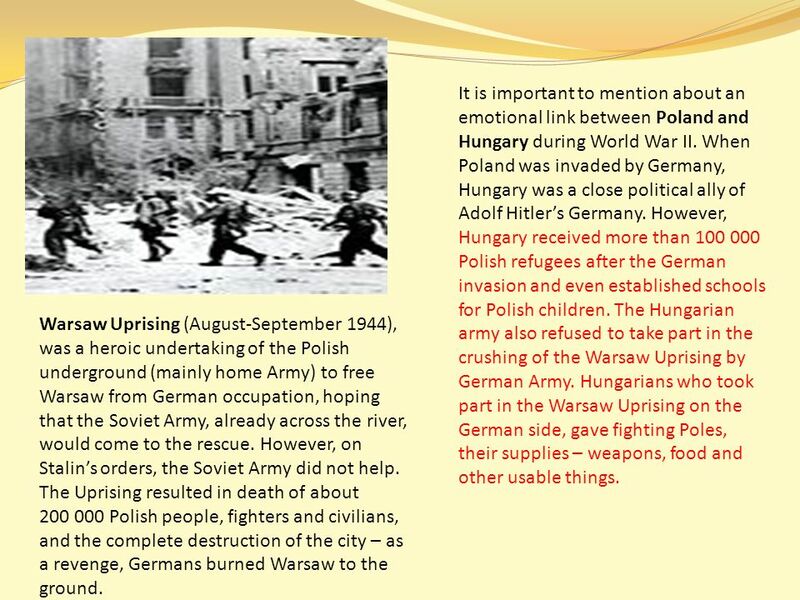 It culminated with The Warsaw Ghetto Uprising in 1943 and the Warsaw Uprising in 1944. The Warsaw Ghetto Uprising (April 19 th ) was the heroic, but hopeless action of Jews who were seized in the small Warsaw ghetto. It followed mass transports of Jews from Warsaw ghetto to the Treblinka and Auschwitz concentration camps. Out of 450 000 people, which had originally been squeezed into the small ghettos area only 300 survived. The ghetto area was completely ruined. 14 Warsaw Uprising (August-September 1944), was a heroic undertaking of the Polish underground (mainly home Army) to free Warsaw from German occupation, hoping that the Soviet Army, already across the river, would come to the rescue. However, on Stalins orders, the Soviet Army did not help. The Uprising resulted in death of about 200 000 Polish people, fighters and civilians, and the complete destruction of the city – as a revenge, Germans burned Warsaw to the ground. It is important to mention about an emotional link between Poland and Hungary during World War II. When Poland was invaded by Germany, Hungary was a close political ally of Adolf Hitlers Germany. However, Hungary received more than 100 000 Polish refugees after the German invasion and even established schools for Polish children. The Hungarian army also refused to take part in the crushing of the Warsaw Uprising by German Army. Hungarians who took part in the Warsaw Uprising on the German side, gave fighting Poles, their supplies – weapons, food and other usable things. 15 P oland also received a lot of help from Romania during the war. The Romanian Government offered shelter to 60000 military and civil refugees together with the necessary equipment and military technique – this was extremely nice hospitability shown by the Romanians that reflected also their symphaty for the Polish refugees leaded by Ignacy Mościcki, the president of the Polish Republic and Józef Beck, the Minister of Foreign Affairs. The war had tragic consequences for Poland not only because of the casualties: even though Poland had the government-in-exile, army that fought on the side of Allies constituting one of the largest forces, and active underground, Poland was betrayed by its allies, England and the United States – the international treaties of Yalta and Potsdam left it after the war, against wishes of Polands government and people, in the sphere of the Soviet control. The borders of Poland changed significantly – the whole country moved geographically 300-500 km to the west. Originally Polish areas in the east were incorporated into the USSR and their inhabitants settled originally German cities in the West: Wrocław (Breslau), Gdańsk (Danzing) and Szczecin (Stettin). 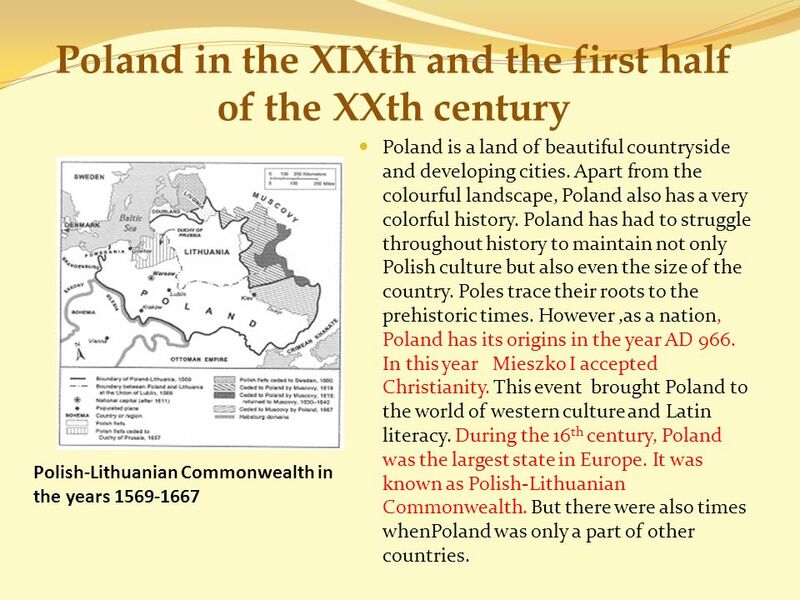 Download ppt "Poland is a land of beautiful countryside and developing cities. Apart from the colourful landscape, Poland also has a very colorful history. Poland has." Central Powers Defeated Karina Harada & Mona Lamug. THE EASTERN FRONT 1941–1945 By: Emily Donovan. INTRODUCTION  The Eastern front was a “war within a war” during World War II. Basically, Germany tried. 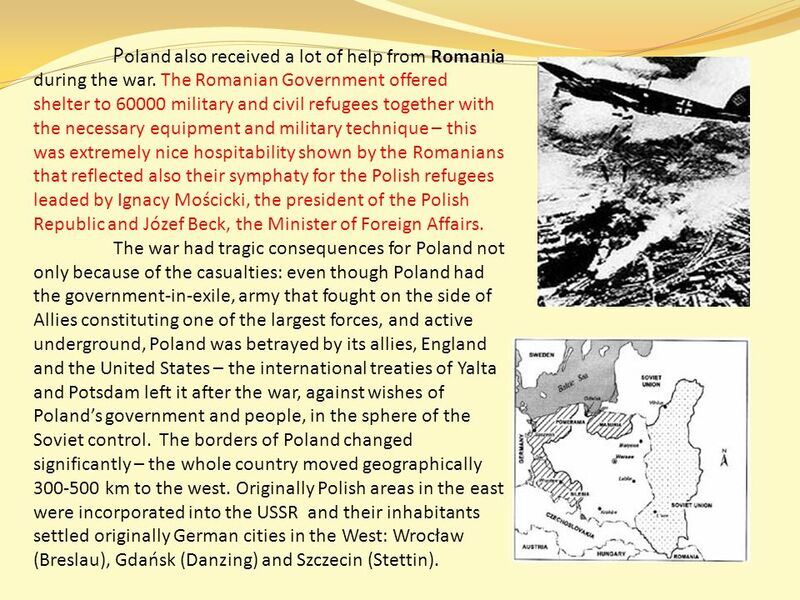 By Abbie D., Jamie D., Cade G., Dylan M., and Cassie R.
Appeasement and the Road To War Poland and the Outbreak of War 1939.  Germany dug itself out of depression by rearming and expanding their armed forces (both of which violated the Versailles Treaty that ended WWI)  Unemployment. 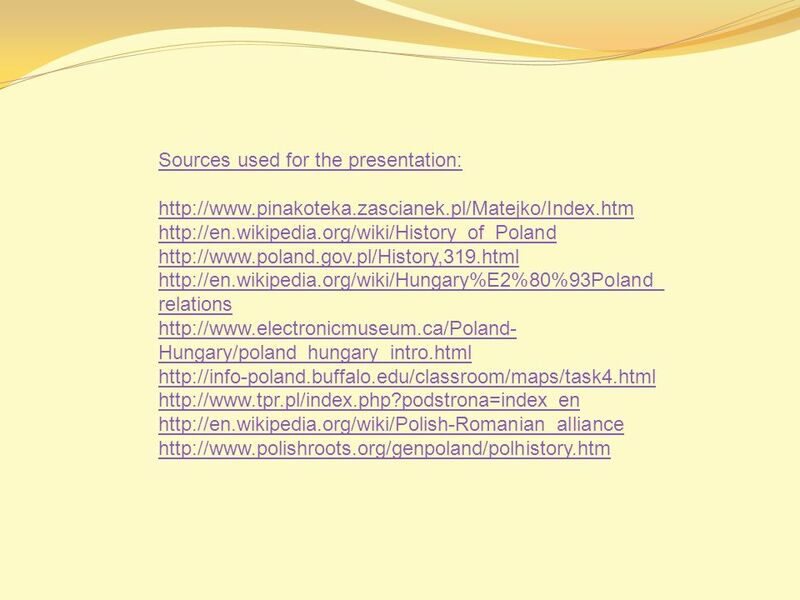 CST Background to World War II Poland. CST Poland.